My Texas Defender Warded Off A Speeding Ticket! A few months ago I was stopped by a local Texas cop for speeding. I handed him my driver's license and License To Carry card, as a courtesy. He thanked me for the courtesy and asked if I was carrying and where the gun was. I told him that it was on my hip IWB. He asked, "Out of curiosity, what are you carrying?" I said, "A double-barreled shotgun." You should have seen the look on his face. He asked me how I could carry that gun on my hip and I told him I would show him if he liked. His curiosity got the better of him and he agreed. I unholstered and unloaded my Texas Defender (Pikes Peak model) and handed it to him. He said, "This is just a derringer. Where's the shotgun?" Then I handed him the two .410 000 buck shells I had removed. We spent the next 5 minutes talking about the gun. Then he handed back the gun and my licenses and told me to have a good day. So, Bond Arms got me out of a speeding ticket. Thank you Bond Arms! I had never owned a "good gun" other than a 22 cal. Ruger single six made in 1957. My guns are wall hanger shotguns and a collection of black powder cap and ball revolvers which are only replicas of the guns used in the civil war. A few years ago (yes years), I started looking for the right gun for me. Since I'm no "marksman", I felt that I needed a 410 for protection. 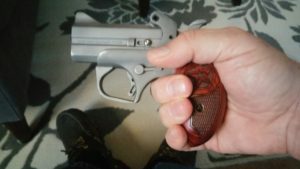 I had looked at the large bulky revolvers and just couldn't bring myself to get one. I woke up one night in December of 2017 about 2:00 and turned on the TV. I just caught the last part of a Bond Arms commercial and thought this is the gun for me. Before this time, I had never heard of Bond Arms. After spending many hours on the internet and looking at them at a gun store, I knew which gun I wanted. Since this store was in another sate, I had to get another gun shop to order the gun. After 2 weeks, I got my Texan with the 6" 45/410 bbl. A week later, I got my holster from Bond Arms. The 1st time I took it to the range, a man I knew was there with his new 9mm semi auto with the laser sight. When he looked at my derringer, he said it looked like something John Wayne would hang on the wall. I told him with the 410, who needs a laser. The second time I went to the range, another guy asked me what I was going to shoot. When I told him "a derringer", he laughed out loud. After sending some 3" 410s and some 45 long colts down the range and hitting targets at 40 feet away, (remember I have never shot a gun that much) he came over and wanted see my gun. He was very impressed. I was even more impressed and just like this gun so much. Maybe I'm a brand new gun nut, but I just like holding the gun while watching TV. Thanks again Bond Arms. P.S. While talking about some things including my holster, I found the people that I talked to at Bond Arms just great. I finally took my new Bond Bullpup 9 to the range last week and I have to say that this firearm is fabulous. It will now officially be my carry firearm and replace my Kahr CM9. Flawless performance from this gun and the accuracy is amazing. Standing at 7 yards (I typically shoot at 10) I was able to shoot a 0.5 inch group. Yes, you read that correctly. That was after only after 4 mags of practice to get familiar with the firearm. The accuracy from such a small firearm is amazing. Also, the grips and balance are outstanding. This firearm fits my hand like it was custom made. The palm swells are perfect. This gun is so controllable as well in light of its compact size. The trigger on this gun is beautiful. A seven pound pull on a DAO gun is great and the pull is so smooth. I think I will be getting another one for my wife as her CCW. It is so easy to rack the slide on the Bullpup (she was unable to do so with the Kahr since the mainspring is very strong, but the Bullpup is a breeze). She was only able to rack on a much bigger firearm like a Glock 17. I can't say enough good things about the Bullpup. I have about 100 flawless rounds through this weapon and I couldn't be happier. I can't say enough good things about this gun. Nice job Bond. 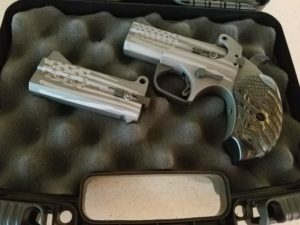 Awesome Firearm And The BEST Customer Service! I recently purchased a Texas Defender. This is my first Bond Arms Firearm and not my last. I have owned a different make of derringer in the past and shooting it felt like hitting your hand with a ball peen hammer. Not so with this firearm. It was purchased thru a dealer who said a lady owned it. I have watched every single youtube video Gordon uploaded and learned how to shoot this wonderful firearm. I now have 3 more barrels for it and I will be shooting it this year in side matches this our SASS group. This firearm spends more time with me at my side than my wife of 44 years. I love them both very much. Everyone, especially the young ladies and men I work with love it and want to shoot it and have shot it. I should be a field rep for Bond Arms, but I do love to show it off. For Christmas my wife purchased from you a BAD driving holster and another barrel for me.This is where your customer service comes in. I have made numerous calls to a wonderful customer service rep by the name of Kali Polk. She was so patient with me and answered over a hundred questions about barrels, holsters, fit and finish of the firearm and she even sent pics to me of a frame to help me out. This is what makes your company so great to do business with. She is a marvelous reflection of what a great American Company is all about, and she is a Diamond for your customer service. Thank you Kali, and all of you at Bond Arms for helping to make America great again with your customer service and a great quality firearm. May God bless all of you and have a safe,happy and prosperous New Year. When I first opened the box on my BULLPUP 9, it looked like a modern collectors item with its satin-finished rosewood grips. I ran straight to the range with a 50-round box of Remington UMC 115 grain FMJ. Everything about the gun was solid. I could tell the tolerances to which it was manufactured were tight, nothing rattled, nothing loose. I pulled back the slide on the first round, making sure to travel to that fully racked click where I could see the bullet pop up to be chambered. I pulled back on the trigger and BAM! It solidly kicked srtaight back, with no flip to the side or upwards. It was the feel I have always expected from a handgun but never fully realized until then. I cannot wait to get it down to the shooting range again and again. The Bond service department and engineers are on top of this pistol and its features to make certain that it is the best handgun experience on the market and remains the best handgun ever produced. If you purchase from Bond Arms, you will be glad you did for many reasons. Value, quality, carry comfort, security, versatility, and a host of other reasons come to my mind for your purchase. Happy shooting! I fired my Bullpup 9 today for the first time. Not a single jam or other problem. That in spite of limp wristing most of the first dozen rounds. After those first rounds I gripped it more firmly it and it was a pure pleasure to shoot. My firm grip isn’t very strong compared to most people so that further impressed me how well it shoots. I normally can’t shoot more than about 20 rounds through a handgun per range session because of damaged wrists. I was shocked when I realized that I put 92 rounds through it with no pain during or afterwards. I am able to wrack the slide with ease too. The fit of the grip to my hand is very comfortable. The overall the fit and finish of the both the beautiful grips and the rest of the pistol are fantastic. I thought the grips were one piece because the seam is so difficult to find. The trigger and slide action are both very smooth. When I look at the quantity of the parts and the quality of the machining and fitting I feel that I received exceptional value for every cent I spent. Thank you for making such a fine pistol. I look forward to shooting this again. The employees at Bond are some of the best I've ever worked with. When I call there's never a long "On Hold" music, and they are very helpful. I called several months ago wanting to purchasing a 6 inch .410/.45 barrel for my Ranger. I was told that at that time the only way I could buy a 6 inch .410/.45 is to purchase a TEXAN which had that barrel already on it, they weren't available as a barrel only purchase. A week or so ago I received a telephone call from Ryan at Bonds Arms informing me that they were running a special sale for a limited time on the 6 inch .410/.45 barrel and I could buy it with 25% of the price going to the Harvey relief fund. Now that's a company with their hearts in the right spot! I bought the barrel. THANK YOU BOND ARMS!!! I own a number of weapons and have a unrestricted cancel carry permit. Most easily concealed weapons are not meant to be used for target practice and are recommended for around 10 yds. My "cowboy" model from Bond Arms, I believe is the perfect conceal carry weapon on the market. Easily concealed, simple and maximum damage delivered. I purchased the pocket holster, driving holster and Ram Horn grips - their beautiful and add a "special" touch to a special weapon. I was expecting a "mules" kick when I first fired it but it didn't happen. Fired two boxes of #7 410's, several copper disc/003 buck and several .45 rounds with no problem at all. I'm right handed and found that I could easily get off two quick shots by cocking with my left thumb. Using Bond Arms belt ammo holder, reloading was quick an easy. Bond Arms has a superior weapon and supporting equipment - congratulations and I thank you. I ordered my Old Glory and received it much faster than expected. I'm very pleased with the quality of firearm it is and how simple to change out the barrel. I've shot it already and is an awsome derringer. I love the fact it's made in the USA.